Durango (Viscaya) circa 1522–after 1572 Logroño? Arte subtilissima, por la qual se enseña a escrevir perfectamente, hecho y experimentado, y agora; de nuevo añadido. Repaired when rebound in the eighteenth-century: title-leaf laid down, margins of folios F5 and F6 repaired, marginal paper repairs in other leaves (occasionally touching borders and signature letters), slight staining; however, for a book of this kind, in unusually fine state of preservation. binding eighteenth-century English calf; gilt frame on covers, spine gilt in compartments. The author, the Basque Juan de Iciar, worked from about 1547 until about 1573 at Saragossa, a centre of culture and the cradle of Spanish printing, as a teacher (of writing and arithmetic) and as a copyist, particularly of choir and service-books for church use, which he wrote in a gothic rotunda style (he is shown on the title-page writing a formal alphabet in a book with one hand and holding a choir book in the other). His aim was to teach children as well as adults, and in the instructions which accompany his specimens, Iciar – influenced by his fellow countrymen Juan Vives and Alejo Vanegas – considers various pedagogical problems, such as whether children should be taught reading before writing, or simultaneously (folios A5–6), and recommends as teaching aids sheets of tin (‘hojas de Flandres’, D5 verso – the idea is similar to that underlying the use of slate and chalk: the child rubs out mistakes with his fingers, and becomes less inhibited in his writ­ing) and alphabets carved in tablets of wood or metal (‘una tablilla de box, o de metal muy lisa’, L4 verso – an apparatus mentioned by Quintilian, endorsed by Erasmus and Palatino: the pupil moves a pen in grooves cut into the letters, until the shapes and movements become natural). The second edition, as befitted its new dedication, to the prince Philip, Regent of Spain, was revised as an elegant picture book. 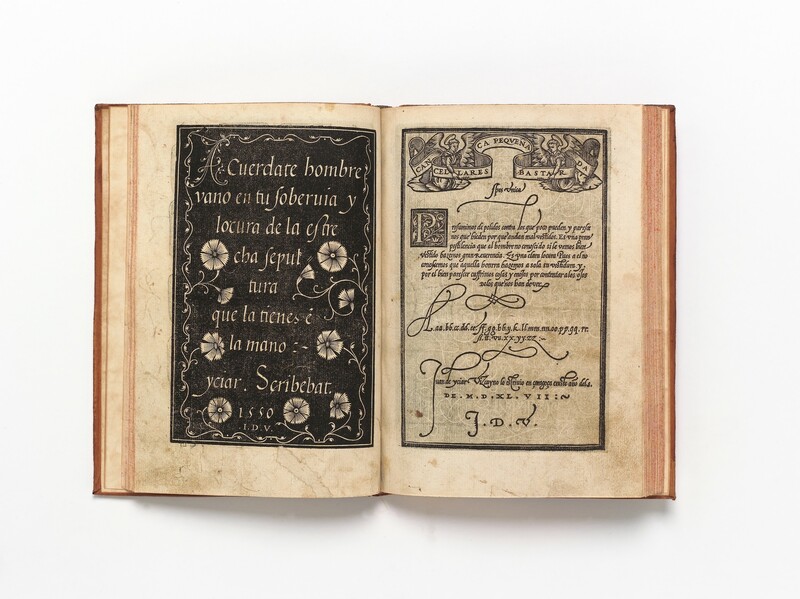 The author, or perhaps his printer, lightened the text: some instructions (notably the ‘Trata de letra Aragonesa’, on folio E8 verso in the 1548 edition) were abbreviated, some recipes (‘para bermellon… para hazer tornasol… para hazer verde lino… agua gomada; y para destemper la clara del hueuo… para preparar la glossa’, folios B6 recto–B8 verso in the 1548 edition) were excised, and the concluding ‘Trato del modo como este libro se hizo’, in which Iciar described how the blocks were made for his book (folio I7 in the 1548 edition), was deleted. A new ‘Epistola Al Lector’ and Latin verses in praise of the author by ‘Blasij Spesij Doctoris Medici’ are introduced. In the new prefatory letter, Iciar claims that certain mistakes (‘algunas faltas’) in the old blocks have been corrected, and that other blocks have been improved by the addition of flourishes (‘muchos rasgos ’). The corrections seem to be no more than several erasures of the date ‘1548’ and substitution of ‘1550’ (e.g. C2 recto, C2 verso). The alteration of old blocks to enhance their decorative effect was more systematic; a typical embellishment is the stippling of the background of blocks printed white-on-black (e.g. C6 verso, C7 recto, E6 verso, H3 recto, H3 verso). 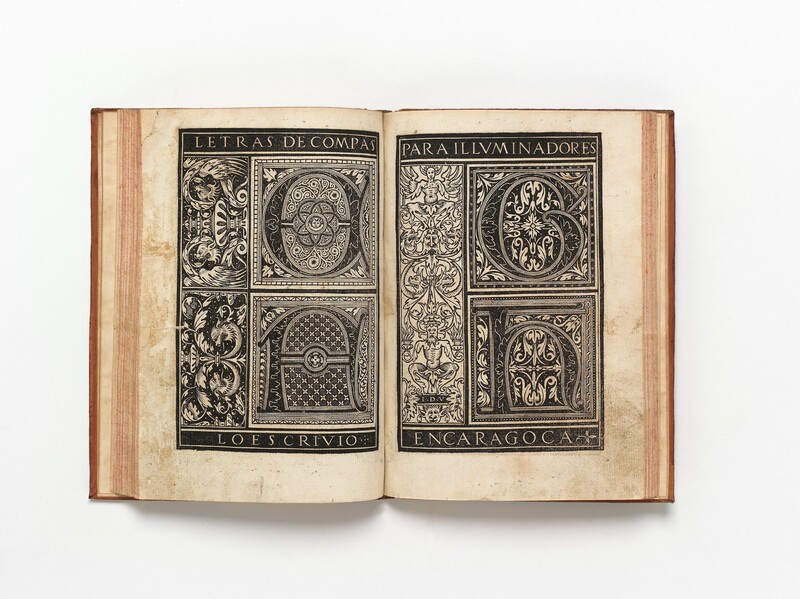 This work, together with the presentation of Iciar’s text within broad frames of newly-cut border ornament (two pieces are dated 1550), and the introduction of an attractive sub-title (a block from the Jorge Coci-Pedro Bernúz stock, in use since 1548; see reproduction by Sánchez p.354), make this one of the most beautiful books of the Spanish Renaissance. 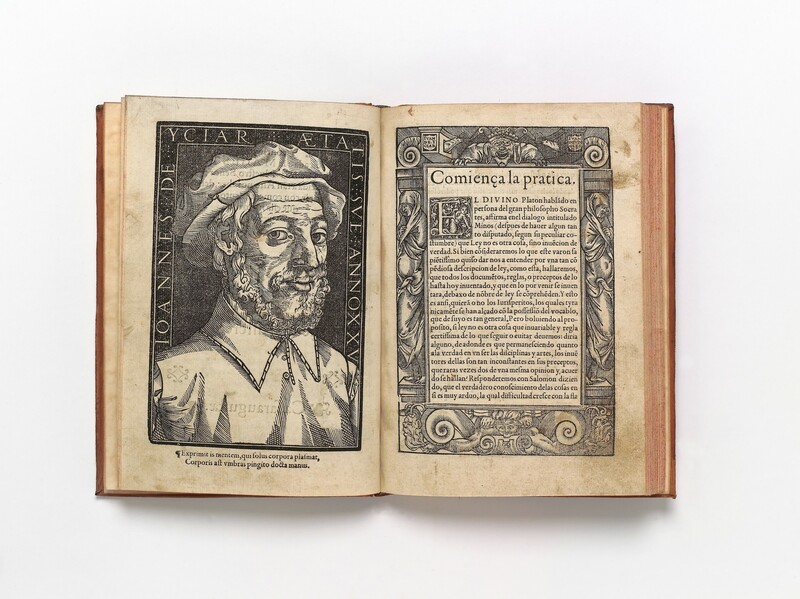 The woodcut border enclosing the title is from the block utilised for the 1548 edition, printed by Bartholomé de Nágera ‘a costas de Alonso de Frailla, y Iuan de Iciar, y Iuan de Vingles’, on 22 August 1548 (Sánchez no. 278). 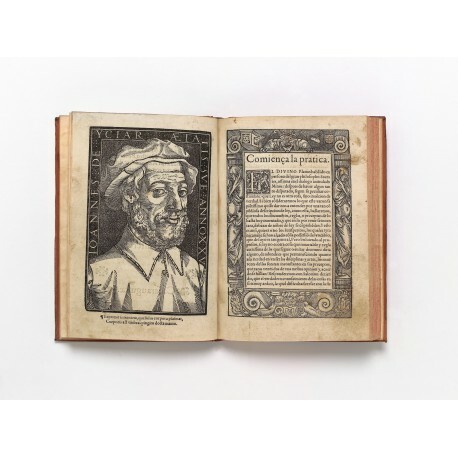 The fine and highly original woodcut por­trait of Iciar also was cut for the first edition, and it reappears in Iciar’s Arithmetica prac­tica printed at Saragossa by Pedro Bernúz ‘a costa del auctor y de Miguel de Cepilla [Zapila] mercador d’libros’, on 16 February 1549 (Sánchez no. 285). It seems that Miguel de Zapila was involved also in publishing the 1550 Arte subtilissima: the title-page of the copy reproduced by Cotarelo y Mori (pl. 72) has his imprint ‘A costa de Miguel Cepilla mercader de libros’ added in the lower margin. ● Amsterdam, Universiteitsbibliotheek, OTM: KL 08-223 ● Avignon, Bibliothèque municipale, 8° 14227 ● Cambridge, ma, Harvard University, Houghton Library, Department of Printing & Graphic Arts, Typ W 560.50.4608 ● Chicago, Newberry Library, Wing Collection, ZW 540 I.164 (‘imperfect: t.-p. and many leaves mutilated, mended’) ● Lisbon, Biblioteca Nacional de Portugal, RES. 5564 P ● London, British Library, C 31 h14 (lacking A1–2, A5–6, H4–5) ● Madrid, Biblioteca Nacional, R/31877 (‘Ej. falto de las hoj. 12, 36 y 86’)9 ● Madrid, Universidad Complutense, B. Histórica-Fco. Guerra 349910 ● New York, New York Public Library, Spencer Collection (Baron Achille Seillière — Robert Hoe copy, washed and rebound by Chambolle-Duru)11 ● New York, Metropolitan Museum of Art12 ● Oxford, Bodleian Library, Douce YY 13 (ff.1-50) ● Paris, Bibliothèque de l’Arsenal, Reserve 8- S- 14639 ● Paris, Bibliothèque nationale de France, Res-V-1463 (lacking B8, D8, E1–2, E7–8, F1–2, L8). 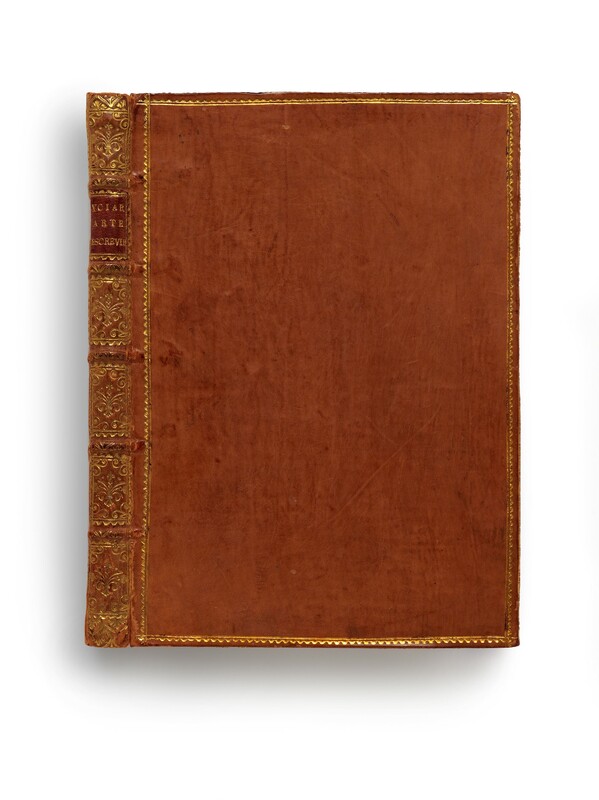 ● the Stirling-Maxwell copy (sold by Christie’s, London, 20 May 1958, lot 79: bound in old morocco gilt, £200 to W.H. Schab) ● Stanley Morison’s copy (sold by Sotheby’s, London, on 28 November 1961, lot 509a: margins of 28 leaves restored, pen facsimile on A3, bound in 19th-century half-morocco, £75; resold on 1 June 1977, lot 135: £850) ● the Richard Ford — Otto Schäfer copy (sold by Sotheby’s, New York, 1 November 1995, lot 124: leaves remargined, some restored with pen facsimile, $8000) ● the Hippolyte Destailleur — Carl W. Jones — Arthur & Charlotte Vershbow copy (sold by Christie’s, New York, 9–10 April 2013, lot 232: ‘Internal marginal tear on E5, some browning and spotting’, bound in contemporary vellum, $37,500). 1. Francisco Vindel, Escudos y marcas de impresores y libreros en España (Barcelona & Madrid 1942–1950), nos. 149–150. 2. Alfred Fairbank and Berthold Wolpe, Renaissance Handwriting (London 1960), no. 78. 3. 1547: ‘Letra redonda castellana’, E1 recto; 1550: B8 verso, C1 recto, C3 verso, C4 recto, D5 recto, I4 verso, I5 recto); undated: C8 verso, D1 recto, D1 verso, D2 recto, D3 verso, D4 recto, D4 verso, E4 verso, E5 recto, E7 recto, G8 verso, H1 recto, H1 verso, H2 recto, H2 verso, I5 verso. 4. Antonio Gallego, Historia del grabado en España (Madrid 1979), p.97. 5. Henry Thomas, ‘Juan de Vingles: a sixteenth-century book illustrator’ in The Library, fourth series, 18 (1937), pp.121–176, figs.1–6. 6. J.P.R. Lyell, Early book illustration in Spain (London 1926), p.145. 7. ● Cambridge, University Libraries, Td.56.1 ● Cambridge, ma, Harvard University Libraries, TypW 560.48.460 ● London, British Library, C.31.h.9 ● Madrid, Real Academia de la Historia, 2/1495 ● Madrid, Biblioteca Nacional de España, R/8611 ● Munich, Bayerische Staatsbibliothek, Res/4 Graph. 98 (Fugger copy; see Kulturkosmos der Renaissance: die Gründung der Bayerischen Staatsbibliothek, catalogue of an exhibition in the Staatsbibliothek, Munich, 7 March–1 June 2008, Wiesbaden 2008, pp.234–235 no. 84) ● Oxford, Bodleian Library, Johnson p 209 (19 ff. only) ● Vilanova i la Geltrú, Biblioteca Museu Victor Balaguer, 1 “B” XVI–A/33 (defective). Wilkinson, op. cit., p.415 no. 10501, cites two further copies which we have not independently verified: New York, Hispanic Society of America; Palma de Mallorca, Biblioteca Pública del Estado. 8. David Becker, The Practice of Letters: the Hofer Collection of Writing Manuals, 1514–1800 (Cambridge, ma 1997), pp.17–18 no. 36. 9. Catálogo colectivo de obras impresas en los siglos xvi al xviii existentes en las bibliotecas expañolas (Madrid 1975), I–44. 10. Una biblioteca ejemplar: tesoros de la colección Francisco Guerra en la Biblioteca Complutense, edited by Marta Torres Santo Domingo (Madrid 2007), pp.45–47, 267 no. 2 (two reproductions). 11. Entered in the Library’s Dictionary Catalog 1911–1971 (Boston 1979), volume 363, p.408 (also in the National Union Catalog, volume 263, p.339), but not in the local online catalogue (catnyp). 12. W.M. Ivins, Jr., ‘A Gift of Writing Books’ in The Metropolitan Museum of Art Bulletin 23 (1928), p.298. 13. A copy lacking three leaves, restored with pen facsimile, was sold by Sotheby’s, New York, 4 December 1996, lot 257 ($3500); a fragment (60 of 86 leaves) was offered by Librairie Sourget, ‘Catalogue 34: Manuscrits enluminés et livres précieux’, Chartres 2007, item 13 (€11,500); and a copy with leaves lacking and in facsimile, in a nineteenth-century half-vellum binding, was sold by Alde, ‘Livres anciens et modernes’, Paris, 1 June 2011, lot 210 (€1,800).